Sony's Venom started its promotional campaign on the wrong foot last month with the debut of the teaser trailer. Fans have been waiting for over 10 years to see a proper version of Eddie Brock's story on the big screen, so it was a big deal when it was announced that Tom Hardy would be starring in a standalone movie. However, the teaser trailer was largely seen as disappointing and a recent rumor suggests that the symbiote is barely shown at all, which echoes what was shown in the teaser. Now, as far as the rumors go, Tom Hardy is warning fans not to listen to them. Tom Hardy took to social media to dismiss any rumors about not seeing the symbiote in the Venom movie until the end of the movie. The actor posted the picture of the face eater insignia along with a caption that tells Venom fans not to trust unnamed sources. Hardy had this to say. "Venom, just sayin Venom suit - myths usually asinine circulate about things usually by those who have failed to garner credible intel." Tom Hardy is implying that the original source does not have correct "intel" in regard to the movie when it comes to how much the Symbiote is seen hanging off Tom Hardy's flesh. Though cryptic, the imagery helps push Hardy's message along. Earlier this week, a report surfaced stating that the symbiote only shows itself in Eddie Brock's body and doesn't come out until the end of the movie. The report from the Manabyte blog suggests that a source close to the Venom project saw the movie without the finished effects and that it was a letdown. The unnamed source goes on to claim that Venom is mostly Eddie Brock, like the teaser trailer suggests. The source explains. "The majority of the movie sees the symbiote manifest itself via veins on Brock's arms, tendrils, additional arms, and a shield during a car chase. You do not see the actual Venom suit until the very end of the film when the symbiote forms it around Brock to fight the big bad government villain who is also using a symbiote from space." It should be noted that this is the same source that reported that Deadpool 2 had terrible test screenings and that the reshoots were going to take forever to fix the sequel. Since that initial report, we've seen plenty of information to refute the claim. That does not mean that this "source" has not seen an unfinished version of Venom, but seeing Tom Hardy come out to dismiss the rumors publicly more than likely means there's more to the story. When it comes to unconfirmed sources, it's usually a lot better to trust someone who is actually confirmed to be close to the project. In this case, we have Tom Hardy, the leading actor in Venom, telling fans not to believe the rumors, which seems like the most credible piece of intel that we've seen about the movie yet. Venom hits theaters on October 5th and you can check out the rumor-busting post below, from Tom Hardy's Instagram account. 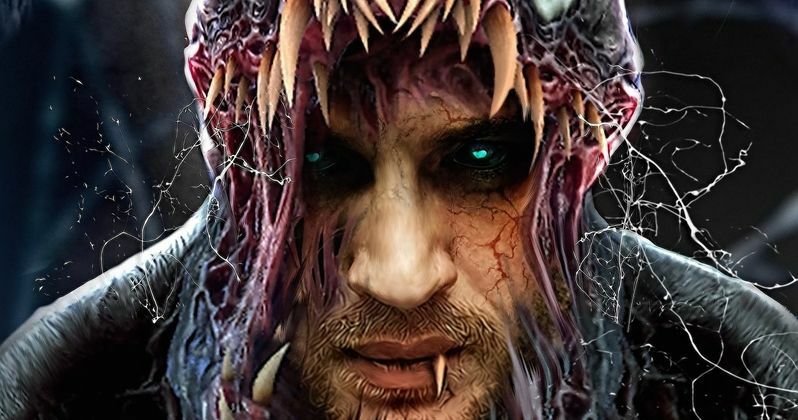 And you can check out some cool new fan art by Royy Ledger that depicts what Tom Hardy might look swallowed up by the Venom Symbiote.